Vol 1 | Issue 1 | July-Sep 2015 | page:27-30 | Sandeep Diwan. Department of Anaesthesiology, Sancheti hospital Pune, India. Introduction: Fascia Iliaca compartment block is used as regional anesthesia option for cases of hip surgery and may be extended to knee surgical procedures. It is a fairly new approach but if anatomy and the technique is understood properly, it gives excellent results. 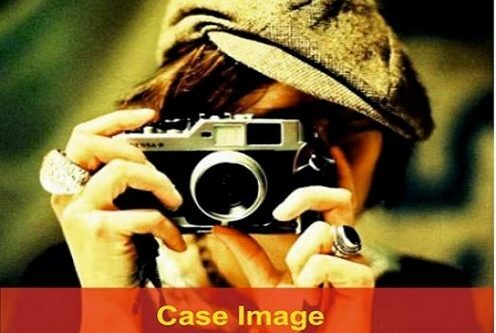 The current article focusses on anatomical and technical aspect of Fascia Iliaca compartment block. Keywords: Fascia iliaca compartment block, Regional anesthesia, Postoperative pain. Fascia iliaca compartment block (FICB) is an anterior approach to the lumbar plexus and was first described by Dalensin in 1989 . FICB is administered in the suprainguinal part of the femoral course. The major part of the femoral nerve lies in the psoas major muscle at the level of L3 -4. It then winds around the lateral aspect of the psoas border at approximately the junction of middle and lower one thirds to lie in front and lateral aspect of psoas at the level of inguinal ligament (Fig 1 and 2).The lateral femoral cutaneous nerve (LFCN) arises higher from the lateral part of the psoas major (Fig 1 and 2). The femoral nerve at this level lies on the iliacus muscle and enveloped by the iliacus fascia. The fascia lata is the one which forms a second envelope. The two fascia forms the basis of a “Fascia Iliaca block”. Why obturator nerve remains unblocked during fascia iliaca block? The obturator nerve lies too medially near the medial border of the psoas. (Fig 3) and unlikely to get blocked during fascia iliaca block. The local anesthetic has to seep under the psoas to reach the obturator on the medial aspect of the psoas. Another view Fig 4 that shows the placements of the femoral nerve lateral to the femoral artery. In the FICB the drug deposition occurs at the point (green line ).The drug travels medially and cephalad and soaks the LFCN and the femoral nerves. Hence in fascia iliaca block the LFCN and the femoral nerve are blocked but not the obturator nerve. Technique of FICB has evolved over a period of time however the anatomical principles remain the same. The techniques described are classical landmark technique, two pop technique, technique using a neurostimulator and technique using ultrasound guidance. Draw a line joining the ASIS and the pubic tubercle.The line is divided in three parts. A point is marked with a medial 2/3 and lateral 1/3. The above point is the point of needle insertion. The FICB can be achieved with a blunt 21G needle or a 18G tuohy needle. The blunt tip of the needle identifies the pops of the fascia lata and iliaca as it penetrates these structures. A simple 23/24 g blunt hypodermic needle is chosen and is inserted perpendicular to the skin just above the inguinal ligament (Fig 7). As the needle penetrates through the two fascial pops are felt. These resistances are of the fascia lata and the fascia iliaca. At the second pop the drug is delivered. Volume of drug is 0.7-0.9ml /Kg 0.33% of Bupivacaine. Beware of the vascular structures, at times the inferior epigatric artery might be penetrated. Contrast study done by the author shows extent of dispersion of the local anaesthetic (Fig 7). The contrast injected spreads laterally along the course of femoral nerve and medially. This assures an adequate femoral , LFCN and probably the obturator nerve block. Lateral view (Fig 7b) shows the contrast spreading towards the lumbar plexus ( L4 ).The spread is almost to the lumbar plexus In the lower part the contrast spreads across two fascial planes and then join to spread uniformly. A stimulating needle 25mm is inserted at the FICB point (Line joining ASIS and pubic tubercle is divided in three parts. A point is choosen on the the medial 2/3 and lateral 1/3. This point is the point of needle insertion). The peripheral nerve stimulator (PNS) is set at 1.0 mA and as in the earlier mentioned technique the needle is inserted as per the two pops. At the second pop the needle is then reoriented to elicit a quadriceps contractions (patellar snap).The PNS is then fine tuned at 0.3-0.4 mA to elicit the similar response. Aspiration is followed by injecting local anesthetic. 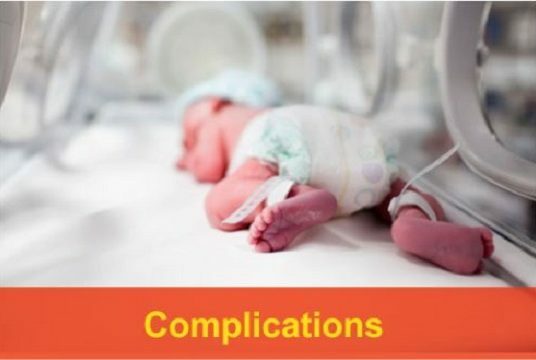 Volume of anaesthetic given is: 0.7ml / kg BW in paediatric group. 1.5% Xylocaine and 0.5 % Bupivacaine – total 20-25ml. Dalens and Coll 1 originally described the fascia iliacus block in children. 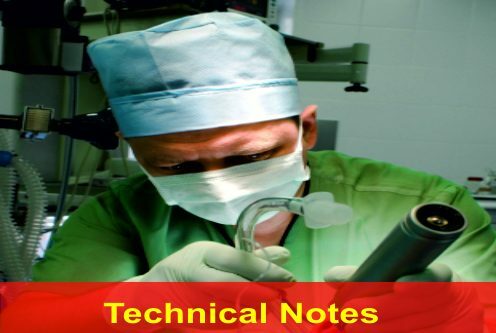 The indications for its use are the same as those for single-injection femoral nerve block. 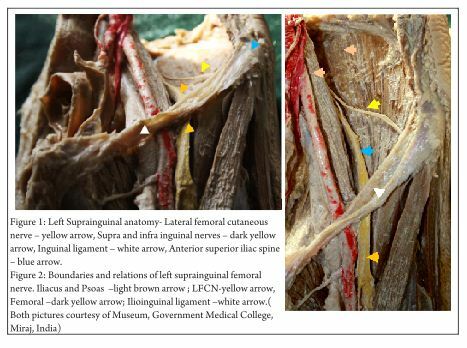 Dalens and Coll1demonstrated a block of the femoral nerve in 100% of cases, whereas the lateral cutaneous nerve was affected in 92% of cases and the obturator nerve in 88% in their proposed FICB. The double pop technique is utilised for applying this block. The double pop refers to the sensation felt as the needle traverses the fascia lata then the fascia iliaca . 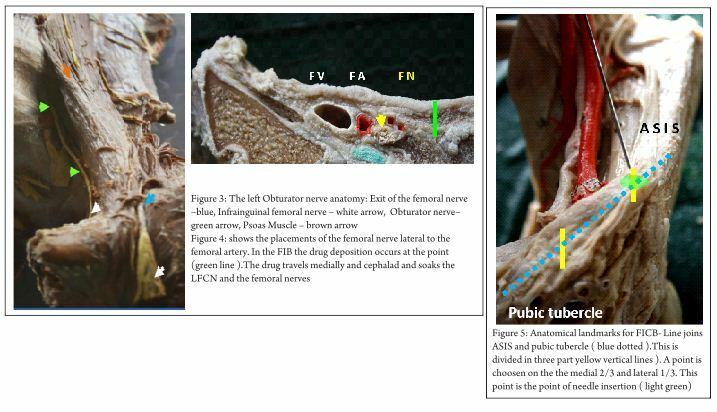 Penetration of both layers of fascia is important for successful fascia iliacus blockade. This technique does not employ the use of a nerve stimulator. b. Femoral shaft surgical procedures. Foss et al  in a double blind randomised study performed FICB in 48 patients for acute hip fractures. 1.0% mepivacaine was injected for the FICB along with IM normal saline as placebo in the study group as against a normal saline FICB with 0.1mg /Kg morphine IM. 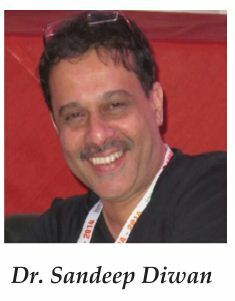 Maximum pain relief was obtained in the FICB group. They conclude that FICB reduced opioid consumption and is effective and easily learned procedure. Spread of the drug in “Three in One block”. Marhofers group 4 studied three-in-one blocks using 30 mL of bupivacaine 0.5% under the guidance of a nerve stimulator. They performed a contrast MRI study and post block it emerged that the local anesthetic blocks the femoral nerve directly, the LFC nerve through lateral spread, and the anterior branch of the obturator nerve by slightly spreading in a medial direction. 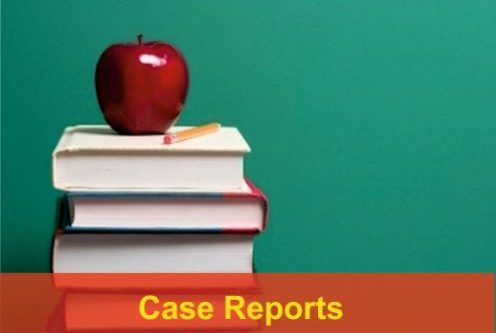 There was no involvement of the proximal and posterior portions of the obturator nerve was observed, nor was there any cephalad spread that could have resulted in a lumbar plexus blockade. 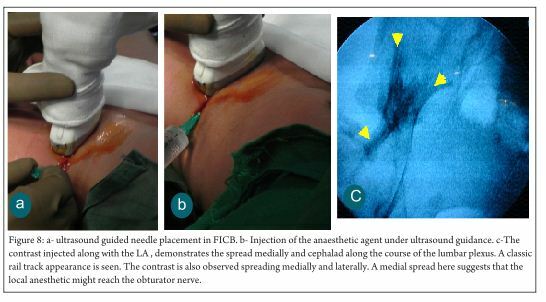 They concluded that the spread of the three-in-one block is confined to lateral, medial, and caudal spread of the local anesthetic, which effectively blocks the femoral and LFC nerves, as well as the distal anterior branch of the obturator nerve. The 3-in-1 technique is inconsistent in producing blockade of both the lateral femoral cutaneous (LFC) nerve of the thigh and the obturator nerve [5, 6, 7]. Neither the use of neurostimulator  nor increasing the administered doses of local anesthetic [7 ] improved the global success rate of the 3-in-1 block. Capdivella et al  mention that the FICB is easy to perform, requires no expensive equipment, and is accessed via a minimal risk approach. Although sensory blockade of the femoral nerve is provided by both block procedures equally, that of the LFC is obtained both more rapidly and consistently with the FICB.The local anesthetic can travel sufficiently under the fascia situated between the psoas and iliacus muscles to block the femoral and LFC nerves , it does not always migrate proximally in sufficient quantities to block the obturator nerve.The fascia iliaca covers the the iliacus muscle passes posterior to the psoas muscle before returning to envelop the muscle around its posterior, lateral, and then anterior aspect, where it envelops the obturator nerve . Capdivella et al suggested that the fascia iliaca compartment block involves a shorter subfascial distance. They concluded that the fascia iliaca compartment technique provides faster and more consistent sensory blockade of the LFC nerve. Lopez et al  demonstrated that fascia iliaca block is simple, safe, and efficient in providing pain relief for femoral fractures at the accident site. Only 1 block failure was reported out of 27 patients recruited. This method facilitates transport to trauma care center and earlier management at arrival. Even patients with partial block required no further analgesia before going to the operating room. Foss et al  supported the use of FICB in acute management of hip fracture pain because it is an effective procedure. Forty-eight patients with hip fracture received FICB injection in their study. They reported that FICB provides excellent pain relief both at rest and on 15° leg lift in hip fracture patients. Candal-Couto et al  studied 30 patients with hip fracture who received FICB and observe beneficial effects of FICB. Monzon et al  reported 63 patients who sustained hip fracture and were administered a single dose of FICB. 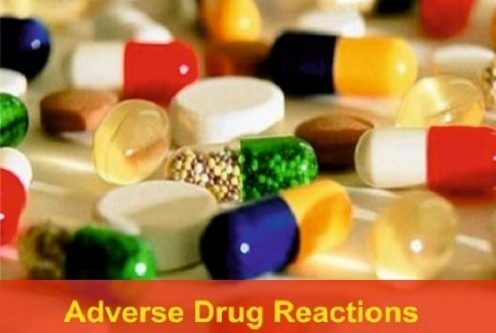 They concluded that FICB injection produced significant benefit by controlling pain, far better than standard parenteral medications, which lasted 8 h at least. Pain was diminished dramatically in the first 15 min after the injection. Also they mentioned that analgesic requirements after FICB injection were minimal. They also first suggested that FICB analgesic effect could be beneficial for preventing delirium after hip fracture. The relationship between pain and delirium has been studied in patients recovering from hip fracture. There is evidence from carefully controlled laboratory studies that pain can impact on cognition and thus might precipitate delirium, particularly in hip fracture patients. Morrison et al  in a large prospective study of 541 hip fractures, reported that 16% of patients became delirious and that severe pain was associated with a ninefold risk of developing delirium. Several studies suggest that, when pain is managed in hip fracture patients, the delirium is reduced. Marcantonio et al , in a randomized study of hip fracture patients undergoing surgery, reported that nine specific interventions, with pain management also included, statistically reduced delirium by one-third. Pain management in this study consisted of round-the-clock acetaminophen (1 g, four times daily), low-dose subcutaneous morphine early in the postoperative period, and oxycodone later in the postoperative period. Atchabahian et al  report a post operative neuropathy after a fascia iliaca block. The FICB was performed under a spinal anesthetic. The needle insertion point was approximately midway between the femoral artery and the anterior superior iliac spine, i.e., approximately 4 cm lateral to the artery but below the inguinal ligament. The width of the femoral nerve at this level is 9–4 mm, which makes it unlikely but not impossible that the needle is inserted into the lateral aspect of the nerve. Atchabahian et al  point out three explanations for the transient neuropathy. (3) related to the surgery rather than the anesthesia. In this authors opinion the FICB above the inguinal ligament and below makes a difference. The reason is the Femoral nerve lies close to the femoral artery below the inguinal ligament and far away above the inguinal ligament. 1. Dalens B, Vanneuville G, Tanguy A. Comparison of the fascia iliaca compartment with “3-in-1” block in children. Anesth Analg 1989;69:705-713. 2. Atchabahian A, Brown AR. Postoperative neuropathy following fascia iliaca compartment blockade. Anesthesiology 2001;94:534-536. 3. Foss NB, Kristensen BB, Bundgaard M, Bak M, Heiring C, Virkelyst C, Hougaard S, Kehlet H Fascia iliaca compartment blockade for acute pain control in hip fracture patients: a randomized, placebo-controlled trial, Anesthesiology. 2007 Apr;106(4):773-8. 4. Marhofer P, Nasel C, Sitzwohl C, Kapral S. Magnetic resonance imaging of the distribution of local anesthetic during the three-in-one block. Anesth Analg. 2000 Jan;90(1):119-24. 5.Parkinson SK, Mueller JB, Little WL, et al.Extent of blockade with various approaches to the lumbar plexus. Anesth Analg 1989;68:243-8. 6.Seeberger MD, Urwyler A. Paravascular lumbar plexus block extension after femoral nerve stimulation and injection of 20 vs 40 ml mepivacaine 10 mg/ml. Acta Anaesthesiol Stand 1995;39: 769-73. 7. Capdevila X, Biboulet P, Bouregba M, Barthelet Y, Rubenovitch J, d’Athis F. Comparison of the three-in-one and fascia iliaca compartment blocks in adults: clinical and radiographic analysis. Anesth Analg. 1998 May;86(5):1039-44. 8. Cauhepe C, Olivier M, Colombani R, et al.The “3 in 1” biock: myth or reality? Ann Fr Anesth Reanim 1989;8:376-8. 9. Lopez S, Gros T, Bernard N, Plasse C, Capdevila X. Fascia iliaca compartment block for femoral bone fractures in prehospital care. Reg Anesth Pain Med 2003;28:203-207. 10. Candal-Couto JJ, McVie JL, Haslamb N, Innesa AR, Rushmerb J Pre-operative analgesia for patients with femoral neck fractures using a modified fascia iliaca block technique. Injury 2005; 36:505–510. 11. Monzon D, Iserson K, Vazquez J. Single fascia iliaca compartment block for post-hip fracture pain relief. J Emerg Med 2007;32(3):257–262. 12. Morrison RS, Magaziner J, Gilbert M, Koval KJ, McLaughlin MA, Orosz G, Strauss E, Siu AL. Relationship between pain and opioid analgesics on the development of delirium following hip fracture. J Gerontol Med Sci 2003; 58A:76–81 . 13. Marcantonio ER, Flacker JM, Wright RJ, Resnick NM Reducing delirium after hip fracture: a randomized trial. J Am Geriatr Soc 2001; 49:516–522. How to Cite this Article: Diwan S. Fascia Iliaca Block- Fascia Iliaca Block- an Anatomical and Technical Description. 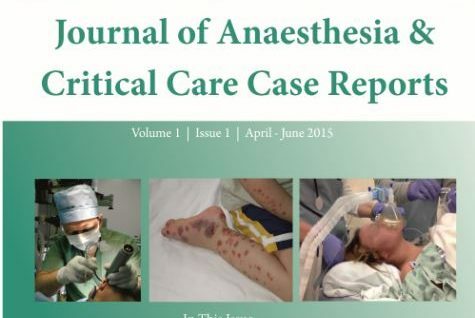 Journal of Anaesthesia and Critical Care Case Reports July-Sep 2015; 1(1):27-30.